While OpenUP is the tangible process product, it is also part of the larger Eclipse Process Framework. EPF is an open-source initiative that was started in 2006 with contributions by IBM Rational of parts of their RUP content and technology. Since its inception the project has actively involved more than 20 companies, and the first release was made available in September of 2007. 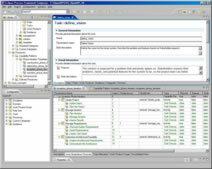 Despite being an Eclipse project, EPF can be used to create process descriptions for any type of development, including J2EE on Eclipse or .NET using Microsoft Visual Studio. OpenUP borrows many strokes from RUP which it blends with agile practices, and the result is a complete process that suites many smaller-scale projects. It can also be extended for those projects and organizations that have more challenging circumstances. Even if the OpenUP process is the focal point of EPF, it is only half the story. Much of its value lies in the fact that it is open source and that it is based on a standardized meta-model, called SPEM . The advantages of open source are obvious: it can be used by organizations of all sizes at no cost. It also means that anyone can share best practices in the spirit of open source. The advantage of being based on a standardized meta-model may not be as obvious, but is key to the overall success of EPF. Concretely, this makes OpenUP extensible and it can be augmented with any combination of standard, 3rd-party and proprietary practices. 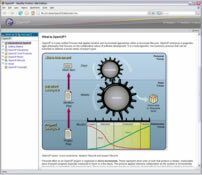 Just like UML provides a standard language for software design models, SPEM provides a standard language for definition and exchange of process models. With SPEM, process is expressed as a set of elements and components, and it is modular as opposed to a monolithic whole. This is where EPF Composer comes into the picture. It provides the tools both to create new process content and to tailor OpenUP by selecting the desired set of components. It is a fully-featured process engineering tool and any organization can use it to develop their own process best practices, as well as share those with other EPF users. This is the "grand vision" of EPF: to build an open source community around EPF, where industry best practices can be downloaded and exchanged. With this first release, this grand vision is starting to come into existence.